Growing up, the only exposure I had to cats were at my friends’ houses. My parents exclusively owned dogs. I always expected I’d own dogs too when I became an adult. However, I married a cat lover and he quickly converted me into one! I have three cats currently and they are my babies. I love spending time with them. My cats, Princess, Misty and Reggie, have their own unique personalities. Princess is a diva and likes to be in control. Misty is on the timid side and very gentle and loving. Reggie is a feisty and playful little guy who gets into EVERYTHING! 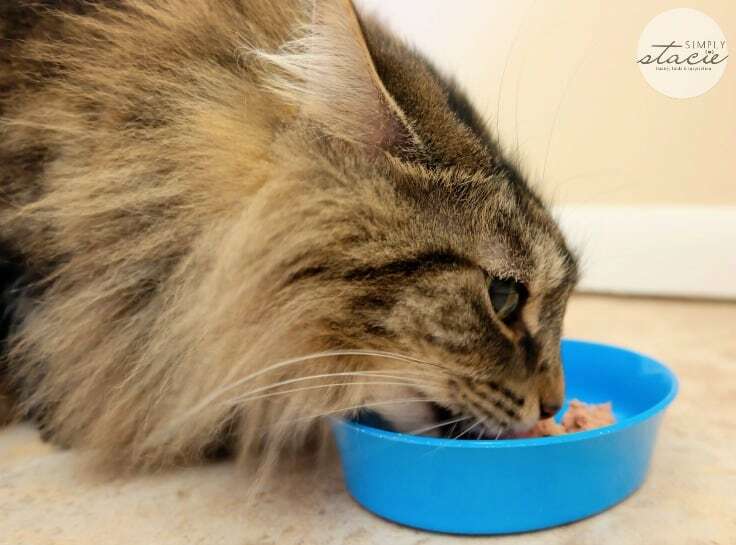 One thing all three cats have in common is that they love to eat. It’s meow city around here at kitty meal time. 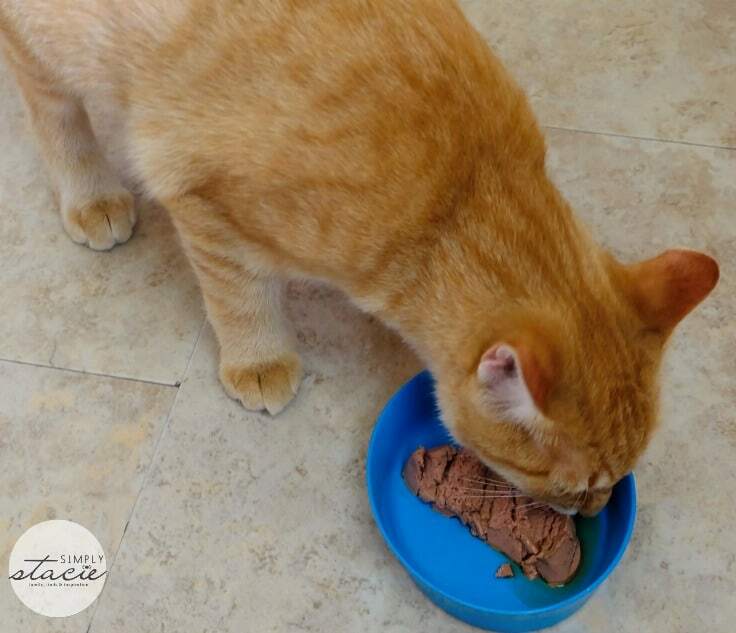 We were recently introduced to the new SHEBA® PERFECT PORTIONS™ premium cat food. Princess, Misty and Reggie were in for a real treat! I love their unique packaging. Each one contains two servings of SHEBA® Pate. Just snap the pack in half, peel pack the packaging and place it in your cat’s dish. If your cats are like mine, they will come running. I know to expect a chorus of meows when I pull out the cat dish and rip open the package. 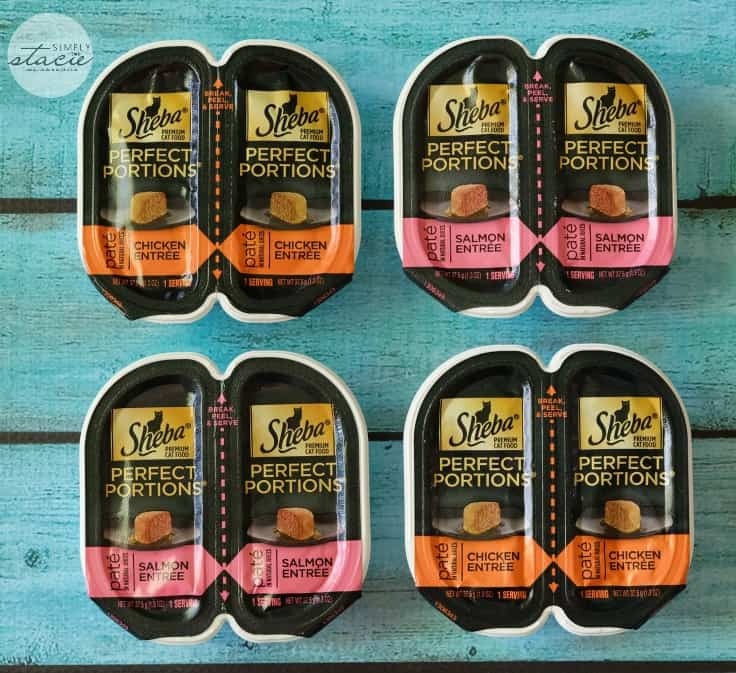 SHEBA® PERFECT PORTIONS™ are two single servings of SHEBA® Pate and are meat-first. They start with real meat like beef, poultry or seafood as the first ingredient. We all know how cats love their meat, mine included! Choose from Chicken Entrée, Turkey Entrée, Salmon Entrée, Beef Entrée, Seafood Entrée, Chicken & Tuna Entrée, Chicken & Liver Entrée and Whitefish and Tuna Entrée. It’s also important to note that SHEBA® PERFECT PORTIONS™ contain NO corn, grains, wheat, fillers, soy or artificial flavors. 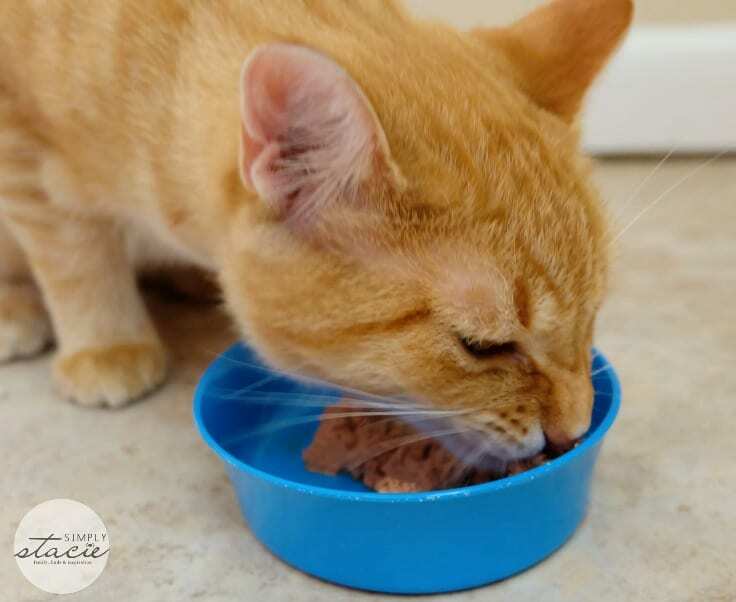 Reggie is devouring SHEBA® PERFECT PORTIONS™ Salmon Entrée. He sniffed it at first and then began to lick it. After a minute, he started to dig in. There was no distracting this kitty. He licked this bowl clean! Now that’s the face of a happy cat. Thanks to the individual serving size, each cat had their own SHEBA® PERFECT PORTIONS™ Entrée to enjoy. 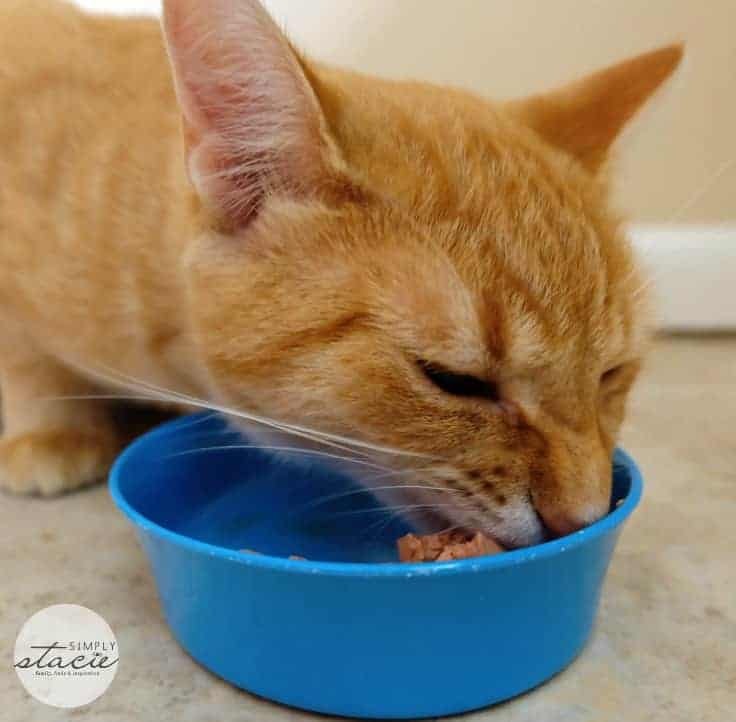 Misty, my cautious kitty, ate her bowl of SHEBA® PERFECT PORTIONS™ Chicken Entrée while keeping an eye open to make sure her bowl was not hijacked by her sister or brother. 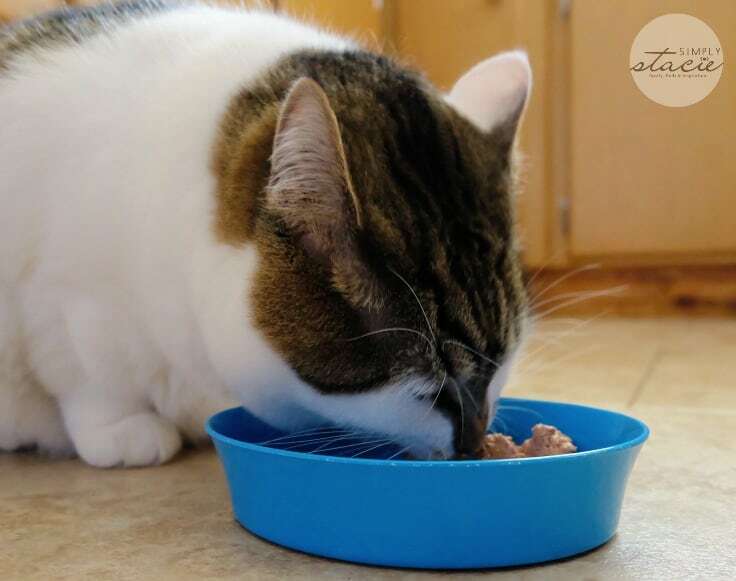 Princess, our resident diva, gave SHEBA® PERFECT PORTIONS™ a “paws up”! She’s the pickiest one of the group and I was glad to see her enjoying her Chicken Entrée. She finished off her bowl too. My cats all gave their approval to SHEBA® PERFECT PORTIONS™. After their meal, they went back to their cat naps and purred away contently. As their kitty mom, I also give a thumbs up for a couple reasons. The most obvious one is that my cats enjoyed the product and finished off their dishes. Secondly, there are NO leftovers or mess! I never like to store cat food in the fridge so it’s great that SHEBA® delivers this convenient, individual serving size for my cats to eat. With SHEBA® PERFECT PORTIONS™, your cats get a fresh meal every peel. SHEBA® PERFECT PORTIONS™ are now available at mass retailers and pet stores across the USA for a suggested retail price of $0.79. Check out their handy store locator to find a store near you. You can also purchase it online on Amazon.com. I have a “Buy One Get One Free” coupon, valued at $0.79, for SHEBA® PERFECT PORTIONS™ to share with you today! Click here to download the coupon and then print off at home at your convenience. Connect with SHEBA® on Twitter, Facebook, YouTube and Google+. I learned that they are grain free and locally sourced! Bee will usually eat most anything I set in front of her, if it’s cat food! I think she would love this food, especially as she is getting older and the dry food is getting harder for her to digest. I learned that you can buy SHEBA PERFECT PORTIONS at Publix grocery store. I like that they use farmed or wild caught fish from environmentally responsible sources… and my cat loves Sheba! I like that they are smaller than regular cans. These would be great for Ralph and Eli. My cats have digestive issues when they eat soft food, I’d love to see if they can tolerate this. I learned that they have variety packs which my cats love. I love that they offer variety. I learned that their products are formulated without corn, wheat, soy, or artificial flavors.